Each application may provide a sign-in feature for its own sign-in system. If, however, the user account can be linked with the Samsung account (as detailed in the Samsung Smart TV Integrated Account Policy), it will be more convenient for the user. When linked with Samsung account, the sign-in status for the application will follow the sign-in status of the linked Samsung account. 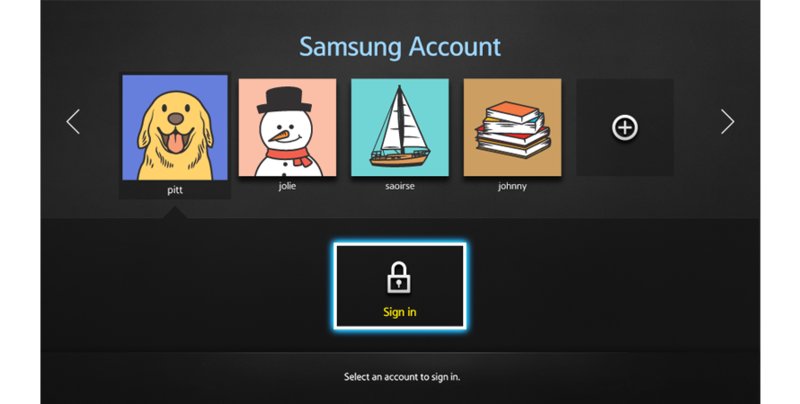 The Samsung account sign-in screen will be displayed as in Figure 7-1. Users can access this screen via sign-in buttons in some screens, the sign-in button on the On-screen Keyboard toggled by Samsung Smart control, and other menus such as Status Display. Apps that use Samsung accounts provide a separate sign-in button on screen that links directly to the sign-in page.